The House was built in 1898 and provides family accommodation spread over two floors with an additional benefit of an extremely useful cellar. 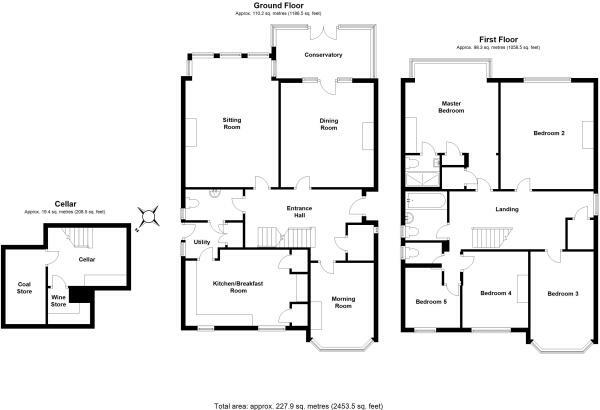 It is understood that the original drawings of the house showed three further bedrooms on the second floor although this was never carried out. The access to the loft from the box room on the landing of the first floor suggests that there would be considerable scope for additional accommodation subject to the necessary consents. We are advised by the vendors that the loft is fully insulated with quilt to the full depth of the 9'' joists. The house is full of character throughout with many original Victorian features such as the cornices and picture rails as well as the beautiful fireplaces including a marble fireplace in the sitting room; another ornate fire surround in the dining room and a most pretty cast iron fireplace in the morning room. There is also a lovely stained glass panel in the front door with matching stained glass light above. Various alterations and improvements have been carried out to the property over recent years. The floors in the sitting room and dining room were also replaced with suspended insulated oak flooring; a conservatory was added, a garage constructed and the gardens landscaped. In 2006 the house was reroofed with new Welsh slate and all of the lead work was renewed. In addition to this, Victorian style gutters and downpipes in power coated cast aluminium were installed. Craigmore is set well back off Tuddenham Road, one of the most popular residential areas in Ipswich, close to Christchurch Park. The Woolpack public house is just a few minutes walk away and is often referred to as a village pub in a town. Bolton Stores is a friendly and well stocked convenience store nearby whilst the town centre is easily accessible on foot. Ipswich (the thriving county town of Suffolk) is set on the River Orwell and has undergone an extensive gentrification programme in recent years, mainly around the waterfront. There are a wide range of shopping, commercial and leisure facilities including a full range of sports clubs and societies, restaurants and high street stores. Excellent sailing and golfing facilities are available nearby on the popular Suffolk heritage coast. Ipswich provides good access to various road networks via the A12 to the south linking to Colchester, Chelmsford & London whilst the A14 links to the M11 and The Midlands. Ipswich railway station provides direct links to London Liverpool Street with a journey time of approximately 65 minutes. Ipswich school is situated on the opposite side of Christchurch Park, whilst St Margaret's C of E voluntary aided primary school is nearby on Bolton Lane. 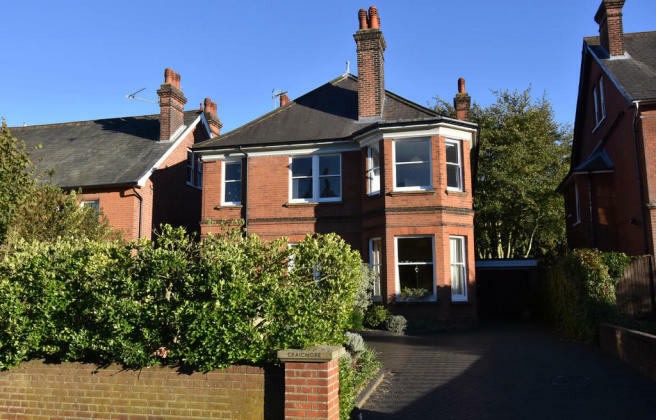 The popular St Helen's primary school is within a 10 minute walk of the property. For secondary education, the property lies within the favourable Northgate High School catchment area. We are advised by the vendors that mains water, gas, electricity are connected to the property (all but one of the radiators in the property have been replaced in recent years) and the plumbing has been updated too. We are also advised that the property is on mains sewage. From Ipswich town centre, head northwest on Civic Drive, at the roundabout take the 2nd exit to stay on Civic Drive. At the next roundabout take the 3rd exit onto St Matthews Street, turn left onto Soane Street and then left onto Bolton Lane. Slight right onto Tuddenham Road, Craigmore will be found on the right hand side. A staircase leads down from the entrance hall to the cellar which is divided into three rooms, one of which is currently used as a workroom and there is also a wine cellar and a store with the original coal chute. A block paved drive sweeps in and leads around the front garden, providing ample parking and turning space. The drive continues past the side of the house to the garage. Single garage with 'up and over' door and power and light connected. There is a second pedestrian access off Tuddenham Road, which leads into the front of the house. The rear garden has been landscaped and has steps leading down to the lawn which extends around the central formal pond which is planted with a variety of plants and lilies. Around the lawns there are well stocked flower beds and shrubberies. The gardens are completely enclosed. A particularly attractive feature of the rear garden is a magnificent beech tree which affords some welcome shade in the summer. Disclaimer - Property reference 100063004071. The information displayed about this property comprises a property advertisement. Rightmove.co.uk makes no warranty as to the accuracy or completeness of the advertisement or any linked or associated information, and Rightmove has no control over the content. This property advertisement does not constitute property particulars. The information is provided and maintained by Fine & Country, Woodbridge. Please contact the selling agent or developer directly to obtain any information which may be available under the terms of The Energy Performance of Buildings (Certificates and Inspections) (England and Wales) Regulations 2007 or the Home Report if in relation to a residential property in Scotland.